Registrations for 2018 Popanyinning Sprint are now closed. This is the on-line entry site for the POPANYINNING SPRINT on the 9th September 2018. THIS EVENT FOR T&EMCC CLUB MEMBERS ONLY. If you do not have a Trail & Enduro club membership you can purchase a SINGLE EVENT CLUB MEMBERSHIP FOR $20 before YOU PROCEED by clicking ONLINE HERE. The event is held on private property so your bike does not need to be registered. You must be 16 years and over to compete. Camping Available Saturday Night (please note: no shower facilities / toilets only). 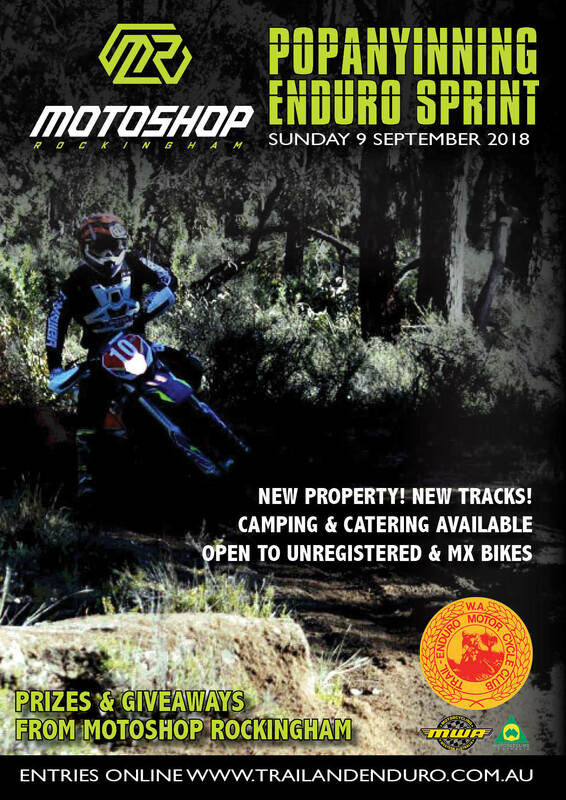 Entries close on Tuesday 4th September 2018 at 10:00pm WST. PLEASE NOTE: YOU WILL RECEIVE FINAL INSTRUCTIONS AND DIRECTIONS TO THE PROPERTY via Email IN THE DAYS LEADING UP TO THE EVENT.